The scene is set, a late evening in March at Franklin Garden’s, the venue for the Aviva Premiership rugby union clash between Northampton Saints and London Wasps’. There are currently thirty-three minutes played and it’s 13-20 in favour of Wasps’. The play resumes with a cross-field kick. The Northampton players rush forward. The ball is caught by Northampton’s Samu Manoa, who plays it off to wing George North. The Welshman breaks at speed to score the try. He twists and turns and avoids the first tackle. The Wasps’ number 10 catches him around his mid-rift and brings him crashing to the ground, but North somehow manages to reach out and score the try. As he crosses the line the knee of the on-running Nathan Hughes’, the Wasps’ number 8 collides with his head. 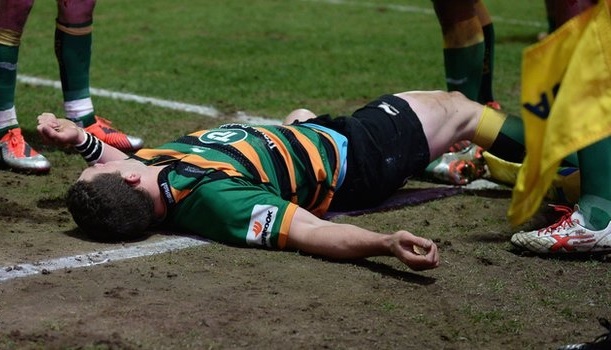 George North lies on the field motionless. He remained out cold for a short while, before being stretchered off the field, wearing a neck brace. The image of North, unresponsive, lying flat in the goal line area is unsettling. What makes it truly horrific is that this isn’t the first time it has happened to North. This is the third time it has happened to him, in the last four months. During the Wales v England Six Nations match, North suffered a double concussion. During a charge down around the thirty minute mark of the game, North received an accidental kick to the head from Dave Attwood. He left the field for examination. Eight minutes later he returned and around the sixty minute mark he suffered the second concussion whilst trying to prevent Mike Brown from scoring a try for England. North appeared to be out cold on that occasion as well. There are those die-hard fans who will say these incidents are an occupational hazard for rugby players. There are those who will even claim that North inspired the subsequent win. After the North incident, the referee sent Hughes off for foul play and Northampton came from behind to win and maintain their spot on top of the premiership. Despite all this rhetoric, the incident highlights the dangers of contact sport and the lack of understanding or proper precautionary measures being taken to protect players. In the immediate aftermath of the Northampton v Wasps’ match, Northampton’s director of Rugby; Jim Mallinder was confident North would play in the forthcoming European Champions Cup quarter-final clash at Clermont Auvergne, citing North’s ability to join in with a post-match sing-song in the dressing room. Mallinder later stated, that North would not be involved in any rugby until he was cleared under a medical opinion. Since then a neurologist has advised North to take four weeks off from rugby pending a re-assessment in late April. However, the International Rugby Board’s (IRB) concussion advisor, Professor Willie Stewart advised that North could endanger his career if he played again during the current season. It is concerning that there is conflicting advice being provided by the medical experts. North is the leading try scorer for Northampton and his absence will be a blow to their European ambitions. A cynic would say that the neurologists’ opinion favours the club agenda rather than taking into account the player’s welfare. It raises serious questions about the duty of care to professional rugby players. A study by the International Rugby Board (IRB) indicates that over the last 15 years there has been, on average a 10% increase in player weight across positions in international rugby and a 5% drop in sprint times over 10 metres. Modern rugby players are bigger and faster than ever before, and although it may be acceptable to bulk oneself up, players are shortening their careers as the risk of concussion and serious injury are greater when you have two teams of behemoths ready and willing to run through one another, taking the bigger hits, in the name of competitive sport. Furthermore individuals within the professional game are having serious doubts about how concussion and the physicality of the game is being dealt with. In 2012, Barry O’Driscoll, uncle to Brian O’Driscoll, resigned from his position on the IRB’s Medical Advisory Board. The underlying reason for his resignation regarded the IRB’s handling of cases of concussion using their Pitch-Side Concussion Assessment (PSCA). Under this system any player who is suspected of being concussed has to be removed from the pitch to undergo a five minute assessment for medical staff, who decide whether the player is fit to return or not. It is a subjective test, and as in the case of George North you wonder if other overriding factors, might determine the return of a player to the field. Rugby Union represents a substantial source of income for the IRB, the risks have to be managed carefully otherwise the sport runs the risk of being labelled nothing more than ‘crash-ball,’ for money. The worry is two-fold, firstly that the mismanagement of concussion incidents in the sport may result in a high profile injury, death or legal action. Secondly, with physically enhanced players populating the amateur game, it too is liable to produce a serious injury or legal action. As recent as 2013, The Guardian reported five cases of players under the age of twenty who died as a result of injuries sustained in amateur rugby. Advancements in training methods, nutrition and strapping physiques are a staple of modern rugby. We may not see this trend diminish anytime soon but the sport on a whole has to figure out an effective system for dealing with the consequences of a game played by such able bodied individuals. It needs to sort this out sooner rather than later or risk, ‘concussion,’ becoming a nail in a potential coffin for professional rugby.